The PanzerBlitz tournament followed a similar format to last year's event with two notable exceptions: 1. Competitors could play either Panzerblitz or Panzer Leader in the preliminary rounds in order to build points to qualify for the single elimination round and, 2. 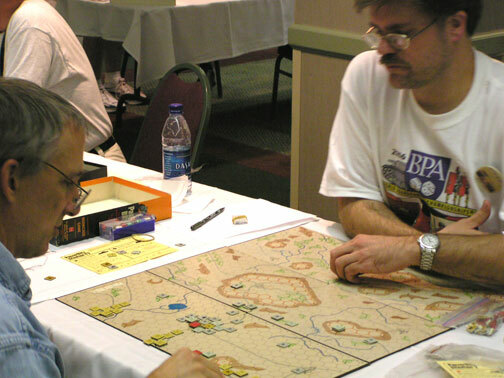 Tournament play began during the Pre-Con. The location of the event, close to where most of the "classic wargames" were being played, allowed players to participate in numerous "iron-man" events and generated many opportunities to play while avoiding the need to seek out an opponent or awaiting the completion of the "next round." Gamemaster Tom Cooper's recent employment change and subsequent thousand-mile relocation in July made it impossible for him to attend the session but Bill Scott, veteran GM of yore, temporarily came out of retirement to fill in through Wednesday, when he was forced to head home because of familial obligations. Bruno Sinigaglio, surely one of the most experienced Gamemasters in the history of gaming, then took over for a day before passing the reins to Chuck Leonard, one of Tom's originally scheduled assistant Gamemasters. Through the Grognard Pre-Con and the WBC, 19 players completed 36 games that included both veterans and newcomers. 34 of the 36 games were Panzerblitz. Two-time champion Marty Musella beat Bert Schoose in one Semi to get to the Final for the fifth time while WBC rookie Greg Tanner from Arizona defeated Rick Northey to gain the other seat. Both games were closely contested. In the Final, Scenario 14 from the PanzerBlitz Wargamer's Guide was the game of choice. This situation had a German Recce Bn commanded by Greg Tanner, assaulting a Russian Command Post with a large relief force coming to the CP's rescue. Greg's Germans immediately assaulted and killed the CP complex in Bednost while his fast armored car units delayed the onrushing Russians and denied the key firing hilltop on Board #1. Marty anticipated the immediate withdrawal of Greg's Germans onto Board 3, so he tried to turn both flanks and trap the escaping Germans. However, correctly diagnosing the impending trap, Greg withdrew the bulk of his forces to the opposite side of Board 2 and skillfully used his fast armor to delay the Russian tank platoons. This tactical maneuver took Marty by complete surprise and, while Marty's Russian infantry and assault gun mopped up the residual German platoons remaining in Bednost, Greg successfully united his dispersed forces on nearby hill 129, picking off several Russian units in the process. At this stage accumulated victory points were even, but Greg subsequently eliminated two units and Marty's Russian tanks could not concentrate quickly enough. On the last turn, despite the Germans being pocketed against the edge of the Board, Greg expertly placed his units where it was impossible for Marty to score the kills needed to win. A very close Final all the way to the end! It was a week of excellent gaming with a group of great guys all with fun on their minds. Our only disappointment was that Tom could not come and Bill had to leave before the end. We are looking forward to next year. Eduardo de Nucci of Argentina defeated Peter Bertram of Georgia in the fourth and final round of the First BPA PBeM tournament to claim the championship of the Single Elimination event over 18 other entrants. Both players bid for sides using S-4b: Panzer Attack (http://www.panzerblitz.org/?form=situation_1&situation=pbSits/PB%20S-4b.sit). Peter bid 7 turns to cross the board with 25 units for the Germans. Other laurelists were Joe Avinger (GA), Randy McInnis (NJ), Fred Schwarz (MI) and John Sharp (FL) who claimed third through sixth respectively.